Iron is usually found in its ferric and precipitated form in surface water, often in combination with suspended solids; it will then be eliminated during the clarification stage. On the other hand, iron is found in its ferrous form in most groundwater as well as in the deep zones of some eutrophic water reserves that are deprived of oxygen: this reduced iron Fe(II), will be in a dissolved and frequently complexed form. and demonstrates that solubility rises as pH and TAC decrease. 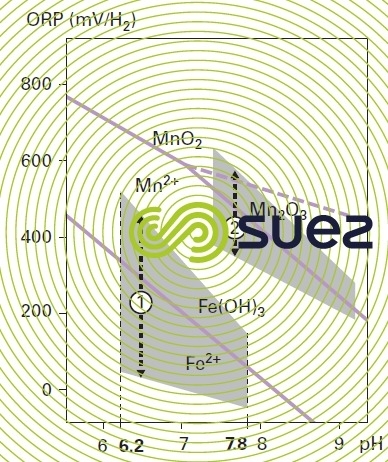 Note 1: when the dissolved iron concentration remains above that theoretical value, instead of precipitating the excess Fe2+ in the form of FeCO3 (siderite), one should suspect the presence of chelated iron, a source of difficulty when applying physical-chemical treatment for iron removal. Note 2: in the presence of H2S, solubility is much lower (because of the low value of the ferrous sulphide solubility product which, accordingly, precipitates). organic: these are complexation phenomena that particularly involve humic, fulvic, tannic …. acids. Note: iron is often found combined with manganese (see section manganese removal) and/or ammonium (eliminating ammonium). 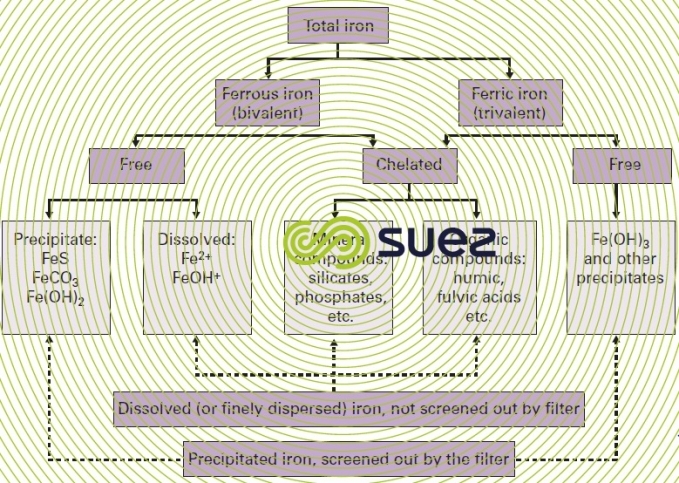 Therefore, in order to establish an iron removal treatment, it will not simply be enough to know the total iron content; we will also need to know the various forms in which this element is likely to be present (please refer to figure 20 for a summary of the different states in which iron is present in water) and this supposes that all the other parameters likely to affect this speciation are also known. It is necessary to determine, on site, all of the water’s unstable properties after having operated the drilling in such a way as to ensure that the sample is representative. Accordingly, the following measurements are essential: temperature, pH, Redox potential, dissolved O2, available CO2, dissolved iron. 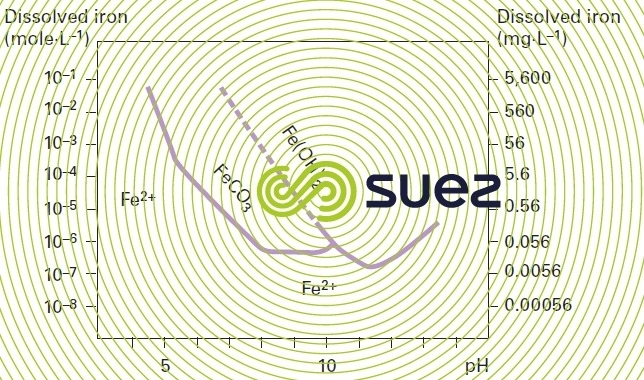 On site or in the laboratory, the dissolved silica and OM (the two most frequent causes of complexation) concentrations need to be determined as well as the parameters likely to call for a treatment linked to or undertaken at the same time as iron removal (Mn, NH4,H2S, remineralisation…). It is also advisable to carry out an examination under the microscope in order to establish whether or not iron bacteria are present. The form in which iron is found in water will primarily depend on pH and on the oxidation-reduction potential; figure 21 demonstrates that it is possible to transfer from a dissolved form of iron (e.g. Fe2+ or FeOH+) to a precipitated form (FeCO3, Fe(OH)2 or Fe(OH)3) by raising the redox potential (oxidation), or pH, or both together. 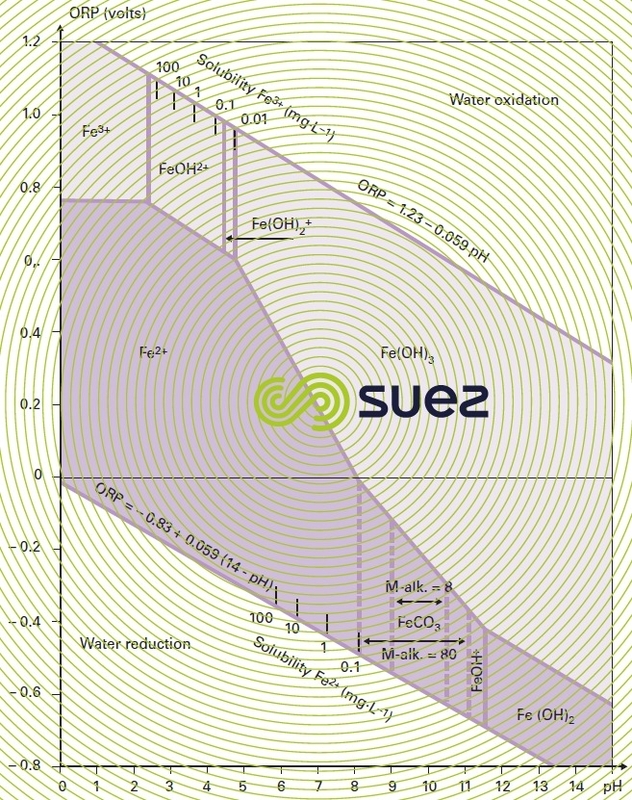 The various possible physical-chemical treatments are based on these principles and, more specifically, on the [Fe2+ oxidation – Fe(OH)3 precipitation,followed by by filtration] sequence. This technique, with air oxidation and filtration, has been in use for many years, particularly on well water. 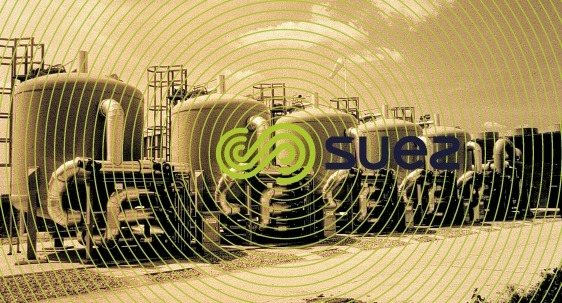 If necessary, it can be supplemented by adding a number of other treatments such as: pH correction, chemical oxidation, flocculation, clarification… It is always advisable to aerate oxygen-depleted water sourced from deep strata, even when a chemical oxidant is also used (to prevent distribution problems: corrosion, taste and odours…). This aeration becomes all the more necessary when the water contains H2S. Ozone and potassium permanganate are the best supplementary oxidants, especially when complexed iron is present. When the water contains high levels of OM or manganese, the amount to be dosed should be identified experimentally if possible. This process applies to groundwater having a maximum iron content of approximately 7 mg · L–1 and which, furthermore, is free of any other adverse properties: manganese, colour, turbidity, humic acids; low levels of ammonium and moderate carbonic attack are acceptable. Consequently, the first step in iron removal will be based on oxidation of the divalent iron using oxy­gen taken from the air. This aeration (see air oxidation) can be undertaken either at atmospheric pressure or at the mains delivery pressure; in the latter case, this avoids the need for recovery pumping and any contact between the water and the external environment. On the other hand, aeration at atmospheric pressure can often be used as a more cost-effective removal of aggressive carbon dioxide (which would require expensive neutralization treatment), and even H2S (see section h2s removal). is the partial oxygen pressure and k a constant that depends on temperature and on the raw water buffering capacity. Equation (2) shows that the higher the pH and the closer the water is to its oxygen saturation point, the faster the reaction kinetics. The reaction time established in the laboratory using synthetic water may be considerably reduced in most plants as the result of certain catalytic effects primarily generated by earlier deposits. Some biological phenomena, discussed further on, follow the same pattern. On the other hand, when humic acids are present, iron oxidation will be delayed. The precipitate obtained will mainly be hydroxide floc Fe(OH)3, as per equation (1). To this can be added, in proportions that vary depending on local conditions, oxihydroxides nFe2O3 n’H2O, some of which will be crystalline, and, occasionally, FeCO3 (high TAC water) etc. 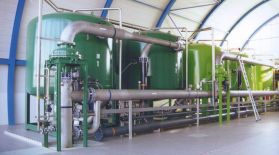 Consequently, treatment conditions and the performance of filtration that follows on from oxidation may vary widely from one plant to the next. 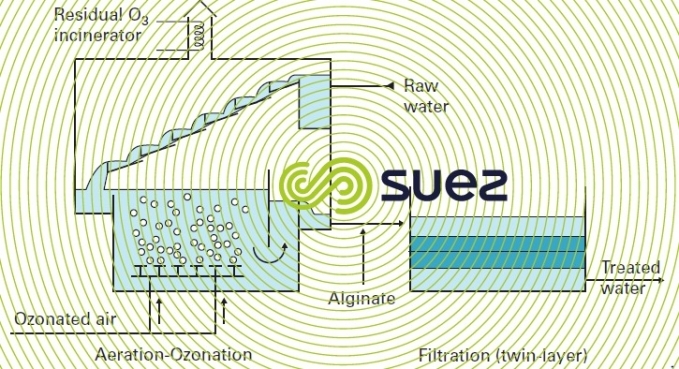 For all these reasons, under optimum conditions, the effective size of the filtering medium may range from 0.6 to 1 mm and the filtration rate from 5 to 15 m · h–1. The mass of iron screened out per unit of filtering area will also vary: 200 to 1,000 g Fe per m2 of sand, depending on the case, and up to 2,000 g · m–2 on a dual media filter (anthracite + sand), this option being reserved to problematic cases. An initially high Fe2+ content will encourage a high retention level. Some substances such as humic acids, silicates, phosphates and polyphosphates, act as inhibitors in the oxidation, precipitation or filtration of ferric hydroxide. Thus, the presence of silica will lead to the formation of FeSiO(OH)32+, a compound that is stable in a base medium (while an increased pH will, however, be required for iron oxidation and hydrolysis); therefore, a compromise must be sought). These effects can be overcome using supplementary treatments: oxidation (potassium permanganate, ozone), coagulation (alum) or flocculation (alginate or approved polymer) according to the case. a filter that is washed by air injection and backwash water. Photo 17 provides an example of such construction. 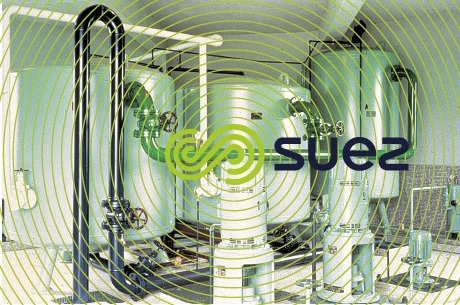 Gravity units use atmospheric pressure cascade (aeration, sprayed…) followed by gravity filtration or pressurised filtration (in the latter case, with or without recovery pumping). Figure 23 shows three examples of construction carried out using this principle (with a water and air backwash). hydro anthracite ES = 0.85 mm, H = 0.5 m.
presence of colour, turbidity, humic acids, chelating agents, etc. resulting in a significant decrease in iron oxidization and precipitation kinetics and/or requiring the addition of a coagulant (alum or ferric chloride) in amounts greater than approximately ten g·m–3 of the commercially available product. Solids contact clarification processes will then be particularly appropriate for treating this water. As an alternative, the lightweight ferric hydroxide floc obtained with groundwater, usually turbidity-free, is also well suited to dissolved air flotation. Carbonate removal using lime creates a high pH and promotes iron and manganese removal. Accordingly, almost all the ferrous carbonate will precipitate at a pH of 8.2 (especially when this occurs at the same time as CaCO3 precipitation) and almost all ferrous hydroxide will precipitate at a pH of 10.5 (figure 26). Partial carbonate removal at a pH in the region of 8 can, therefore, result in total iron removal. 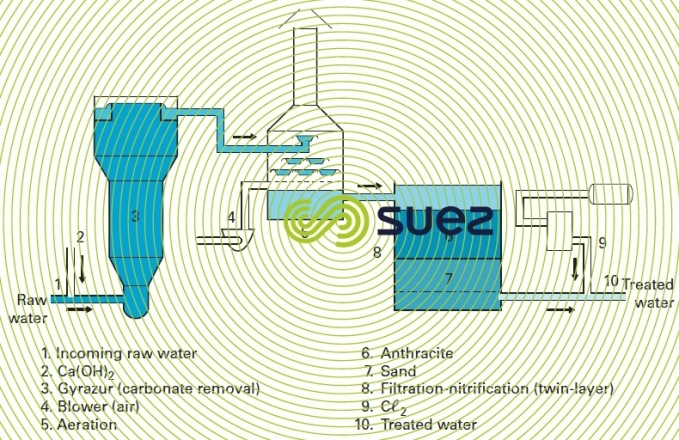 In some cases, especially in fluidised bed carbonate removal reactor (see section the gyrazur, a granular contact mass reactor), the same pH will produce satisfactory manganese removal whereas, in theory, the latter should be combined with total carbonate removal at a pH of 9.5 or 10. This is the principle used for the Ratingen plant in Germany (figure 27): this plant carries out partial carbonate removal, iron removal, manganese removal and nitrification. rH: slightly higher than 14. When the rH falls below 14, these bacteria become inactive; on the other hand, when the rH rises to approximately 20, there will be competition with oxidation and physical-chemical precipitation. Figure 28 zone 1 identifies the preferred biological iron removal domain. In reality, the separation limit between physical-chemical and biological iron removal domains is somewhat blurred; in the “physical chemical” area, the presence of an inhibitor can slow down oxidation kinetics and allow the biological iron removal process to dominate. That is why a pilot trial can often be useful when establishing optimum operating conditions. 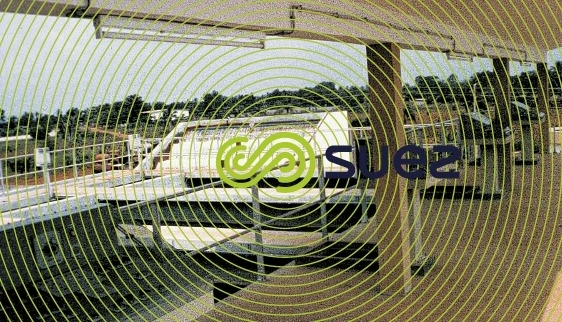 easier sludge treatment : the more concentrated backwash waters are particularly appropriate for thickening and dewatering. a backwash sequence comprising a raw water (9) or treated water (10) backwash and a air scour blower (11). Photo 18 shows a full-scale installation. 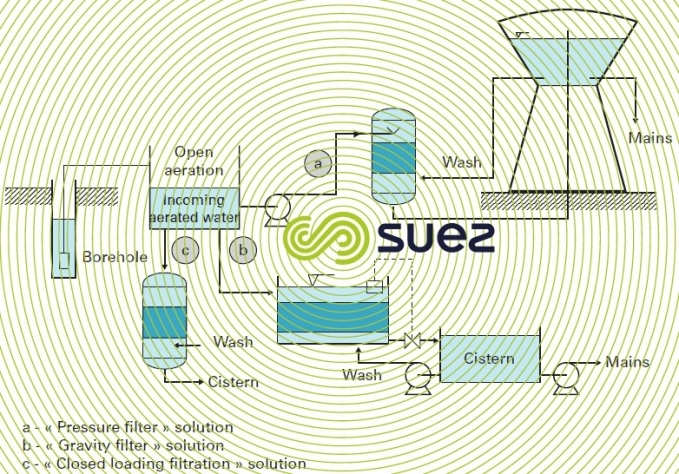 Filtration can also be carried out by gravity in open gravity filters, especially in the case of high flow rates, as in the case of the Lomé (Togo) plan (photo 19). Here, the cascade was specially designed, on the basis of the raw water properties, in order to satisfy the conditions required for biological iron removal. Note: a biological iron removal system will start up more slowly than physicalchemical treatment. It usually requires a 1 to 10 days seeding time (using the iron oxidising bacteria naturally present in raw water). When H2S is present, it has to be removed either through aeration at the inlet (gravity iron removal), or biologically (pressurised treatment) (see section h2s removal).